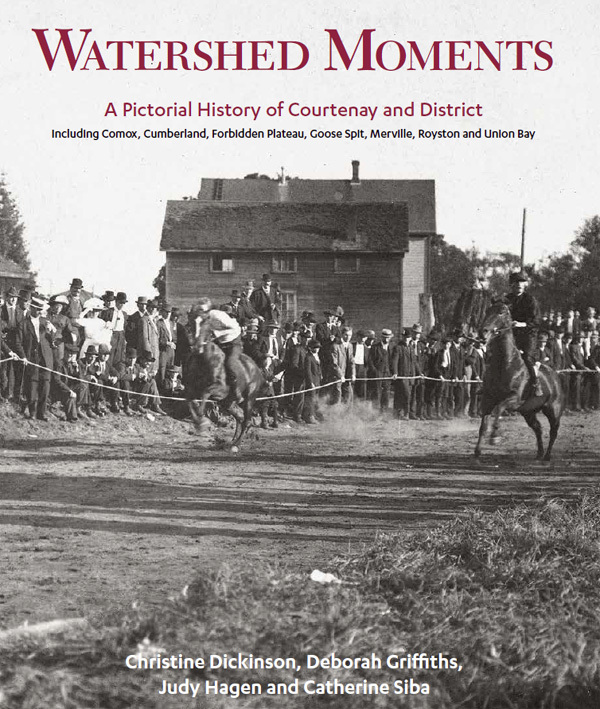 Join co-authors Christine Dickinson, Deborah Griffiths and Catherine Siba as they launch their new book, Watershed Moments: A Pictorial History of Courtenay and District (Harbour Publishing, $34.95; co-written with Judy Hagen) on Saturday, October 24th. An illustrated lecture begins at 1 pm, followed by refreshments and book signing. There is no charge to attend this event. The Comox Valley on Vancouver Island is home to a spectacular watershed: the culmination of snowcap and glacier-fed rivers that flow into the Courtenay River and out onto one of the richest estuaries on the West Coast. Along with the long history of K’ómoks First Nation inhabitation, the community of Courtenay and the surrounding regions have been settled by a variety of people from different cultures and nations. The watershed geography encapsulates these groups’ diverse relationships with the region, in industries such as fishing, logging and canning, and in their traditions and everyday lives. 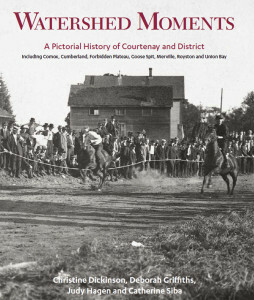 In Watershed Moments, the Courtenay and District Museum opens its vast collection of historical photographs, glass plate negatives and other ephemera. Spanning from the late 1800s to the modern era, here are scenes of K’ómoks village life, boating parties, family celebrations, agricultural events and economic activities. This rich visual depiction of the region and its development is complemented by lively text about ancient fish weirs, bride ships and gentlemen adventurers, back-breaking work and astounding beauty, tracing the complex development of a diverse and ever-changing community. 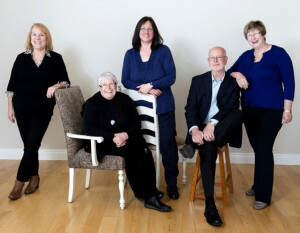 Contributors left to right: Deborah Griffiths, Judy Hagen, Catherine Siba, Ernst Vegt, Christine Dickinson. Christine Dickinson is an educator with a passion for regional history. She co-authored Atlin: The Story of British Columbia’s Last Gold Rush (Atlin Historical Society, 1996), which received the Lieutenant-Governor’s Award. Deborah Griffiths is the Executive Director of the Courtenay and District Museum and has been involved in museum research and curatorial work in the Okanagan and on Vancouver Island for over thirty years. Judy Hagen has been writing her popular “Hunt for History” column for the Comox Valley Echo since 1992. She received an award from the Canadian Museums Association for her book Comox Valley Memories, published by the Courtenay and District Museum in 1993. Catherine Siba is the Curator of Social History at the Courtenay and District Museum. She has led a number of historic digitization projects and has been involved with museum curatorship and research for many years.